Preseason football is almost upon us and some positional battles are beginning to show some clarity. Now is the time to look for players that could be bargains on draft day. While the term sleeper may be thrown around too much, there are still players that aren’t being drafted the way that they may deserve. In this case, we will take a look at several undervalued quarterbacks and the reason that they may be able to outperform their respective ADPs. Cousins is a lot like Jay Cutler used to be, but I would argue that his upside is higher. The Redskins have some borderline elite offensive weapons in DeSean Jackson and Jordan Reed. Josh Doctson has the potential to be another deadly receiver. Throw in the steady Pierre Garcon and unpredictable Matt Jones and this offense is just waiting to explode. Cousins has shown that he can produce at a very high level as well. He threw for over 4,000 yards last year with 29 touchdowns while running for another 5. If he can keep the turnovers in check, Cousins could end up cracking the top ten at his position for a much lower price. Megatron retired, but Stafford still has a lot of weapons. Most of the fantasy football community is going to steer clear of Stafford with the departure of Calvin Johnson. This is understandable, but Detroit still has some very good players to catch passes. Golden Tate has thrived since his arrival in Detroit and with his week to week role more defined (Calvin gone) I see better weekly production in store through the air for this offense as a whole. Add in Marvin Jones (from the Bengals), Boldin in the slot and Eric Ebron with his freakish physical abilities and that offense is formidable. Detroit's strength of schedule is favorable as well, adding to the value. 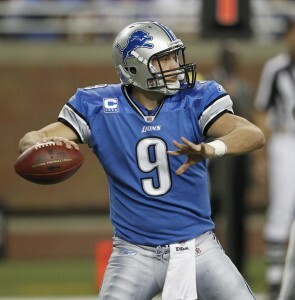 In a two QB league or deep one QB league, Stafford is very viable. Getting Fitzpatrick back in the fold dodged a huge bullet from the Jets’ perspective. Geno Smith does not have the tools to be a professional quarterback and Fitzpatrick showed last year and in the past that he can be effective. The Jets have one of the very best receiving tandems in the league with Brandon Marshall and Eric Decker. The strength of schedule is tough, but there is too much talent to be very concerned. There is every reason for optimism here and Fitzpatrick can probably be had for a very low price. One of the premier wide receivers in the NFL is on the Bills and they also have a top flight running back. Add these things together with the fact that Taylor himself is absolutely electric when he is on his game and the prospects are tempting. The fact is that Taylor is not always on his game and he gets a lot of nagging injuries due to his fast-paced style of play. This is a bit of a gamble, but in a lot of the mock drafts that I have done Taylor has not even been drafted. You could do much worse for a backup or even a matchup based starter, and that is sort of the definition of a qb fantasy football sleeper. Houston should be great on offense this year, but that will depend a fair amount on the development of Osweiler. Last season in Denver he was a bit better than average filling in for Peyton Manning. He had excellent weapons there, but in Houston he might even have better options. DeAndre Hopkins is firmly in the top echelon of wideouts and while I don’t love Lamar Miller, he should produce given the volume that he will see. Rookie Will Fuller should stretch the field and hopefully Jaelen Strong will start to contribute this season as well. Grab and stash Osweiler, he should have some big weeks. It may seem off the wall, but I think that Kaep can bounce back in 2016. Before you write me hateful comments, I realize that he is not the starter right now. I also realize that he is vastly more talented than Blaine Gabbert and has some of the tools that Chip Kelly looks for in his system. San Francisco has a decent number one receiver in Torrey Smith and a great running back in Carlos Hyde. The quarterback strength of schedule for the ‘Niners is tough, but Kelly knows how to run a solid offensive scheme. 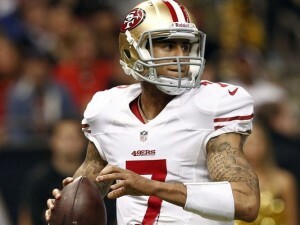 If Kaepernick can win back the starting job, he could provide starter worthy numbers for zero cost. To me, he is a guy worth taking with the last pick or at least watching very carefully. So there are my qb fantasy football sleepers for the 2016 NFL season. Let me know if you love them, hate them or just did not care. No matter what you thought, come back later this week for sleeper running backs, wide receivers and tight ends.